Aerial photo after the Germantown tornado, November 1994. 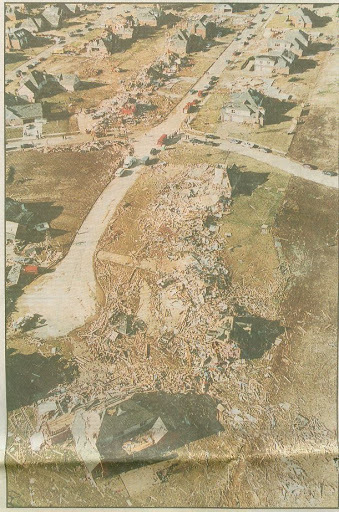 Personal property damage was extensive, including roofs caved in, second stories collapsed, homes lifted off their foundations, windows broken, fences blown away, and trees downed, in addition to water damage from the heavy rain that accompanied the storm. In terms of structural damage, 28 homes were destroyed and 300 others damaged, with damage estimates totaling $25-30 million. There was significant structural damage to the front of Grace Evangelical Church on Dogwood Road and roof damage to Houston High School, located across the street from Grace church. ...damage to Person's Gotten Way home [where the fatalities occurred] was so extensive that rescue dogs, helicopter-mounted infrared cameras, search probes, and heavy equipment had to be used to locate the bodies of the dead under all of the rubble. Two people were not recovered until the following morning. I also wrote a recap of the storm on the 16th anniversary, 2 years ago today. I invite you to read (or re-read) these recaps and also check out these pictures taken by current Germantown Deputy Fire Chief Edgar Babian and this YouTube video of search-and-rescue operations taken by firefighter Tony Fischer. The then-fledgling "Tennessee Task Force 1" urban search-and-rescue squad conducted operations after the tornado struck and just recently returned from more than a week in New York following Hurricane Sandy. Were you in the Memphis area during this storm and what do you recall? Download our iPhone or Android apps, completely updated with a new interface and StormWatch+! Nowcasting services available on our Facebook page and Twitter feed. Winter outlooks are always a tricky endeavor here in the Mid-South. In fact, I'll be honest, I don't like doing them, but they seem to be popular among our readers so I put them together each year with some hesitation. In the interest of full disclosure, I'm not a long-range forecaster. I specialize in nowcasting. So while I can hold my own in the 0-6 hour time frame (and am not too shabby when it comes to 5-7 day forecasts), 3 month outlooks are a challenge. What I can do is cull information from multiple sources, put it in the blender, add a dash of experience and knowledge in Mid-South weather patterns, and present it in a coherent manner. Note that while this discussion is heavy on the effects of large-scale patterns that help determine winter weather regimes across the U.S., and specifically the Mid-South, I do offer my thoughts on what to expect locally, this winter, at the end of the post. Skip ahead to "The Bottom Line" if you wish. At this time last year, I predicted near normal temperatures and precipitation, a couple of chances at winter precipitation, and also a few shots at severe weather late in the winter. As it turned out, temperatures were in the top 10 for warmth, precipitation was very close to normal, and most of the snow that we received was early in the season (late November-early December, before it got excessively warm) with one brief snow event around Valentine's Day. Severe weather struck on January 22 and the Memphis area just missed large-scale events on February 29 and March 2 (both exploded just to our east). Except for the miss on temperatures, I pretty much had the winter pegged! The driving factor in most winter outlooks for the U.S. is the status of El Nino-Southern Oscillation (ENSO), which is somewhat predictable out at least a few months. ENSO refers to variations in the temperature of the surface of the tropical eastern Pacific Ocean and in air surface pressure in the tropical western Pacific. These variations can bring somewhat predictable patterns to the weather in North America. For instance, El Nino during the winter is associated with a more southerly track to the jet stream as it enters North America's western coast, resulting in stormy weather for California and much of the southern U.S. Looking ahead to the winter of 2012-'13, one thing we know (or are fairly certain of) is that earlier predictions of an El Nino winter now appear to be fizzling and long-range models are nearly unanimous that an ENSO-neutral, or "La Nada" (neither El Nino nor La Nina), pattern will be present. Looking back, the last ENSO-neutral pattern brought slightly above normal temperatures and precipitation and some snow of note (2008-09). Typical effects of an ENSO-Neutral winter. Note the presence of a subtropical jet stream over the Mid-South. In fact, the "official" winter (December-February) outlook from the National Weather Service/NOAA for the Mid-South predicts a better chance of above normal precipitation (40%) than below normal (27%) (see second figure below). From a temperature standpoint, equal chances of above and below normal temperatures are forecast, though above normal temperatures are likely across a large area just to the west of the Mid-South (first figure below). NOTE: Not shown, higher chances of above normal temperatures are forecast heading into spring 2013, which could translate into late winter (Feb-Mar) as well. Chances of above (A) and below (B) normal temperatures for Dec-Jan-Feb from NOAA/NWS. Un-shaded areas have equal chances of above and below normal average temperatures. Chances of above (A) and below (B) normal precipitation for Dec-Jan-Feb from NOAA/NWS. Un-shaded areas have equal chances of above and below normal average precipitation. Besides ENSO, there are several other factors that are much less predictable, especially beyond a week or two, that can have major influences on the weather pattern over North America. To see the effects of one of the major players, look at the difference between the last two winters - both of which featured La Nina conditions. 2010-'11 had decent snowfall (9.7" officially), but was very dry when considering rainfall. Last year was very warm with near normal precipitation and very little snow (all of it early in the winter). The difference between these two winters was the strong influence of the NAO, or North Atlantic Oscillation. The NAO changes based on the position and strength of the North Atlantic jet stream. A positive NAO brings above normal pressure to the eastern U.S., which tends to result in above normal temperatures that can extend into the Mid-South. 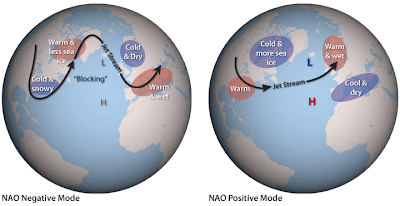 A negative NAO results in lower pressure along the Atlantic seaboard and below normal temperatures, as well as more general storminess, in the eastern U.S. The winter of 2010-'11, which was a La Nina winter, resulted in several periods of cold and snowy conditions due to a persistent negative NAO. The winter of 2011-'12 was influenced by NAO but was overcome in this region by one of the strongest La Ninas in recent memory, resulting in warm and dry conditions across the southern U.S. The negative NAO's effects were more pronounced along the eastern seaboard. The NAO can vary several times over the course of a winter and is generally not predictable beyond a week or two in advance. Thus it is a huge factor whose effects for a season cannot be accurately determined this far in advance. 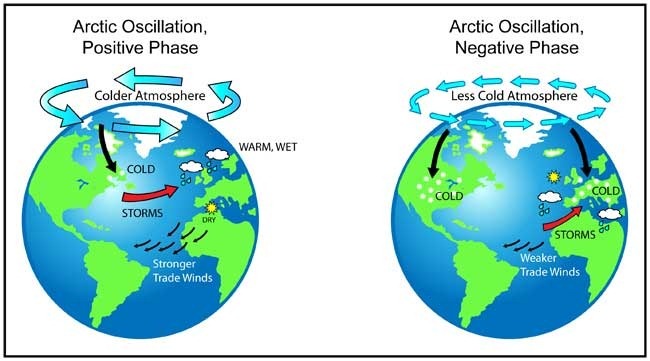 Another global factor is the Arctic Oscillation (AO), which produces similar results to the NAO - colder in the eastern U.S. when negative, warmer and drier when positive. The AO is also unpredictable, though there are early signs that the AO could be in a more negative phase than positive at least early in the winter. The AO was negative for much of the 2009-'10 (El Nino) and 2010-'11 (La Nina) winters, contributing to brutal winter storms over the eastern U.S. and near to above normal snowfall both winters in the Memphis area, despite an overall dry winter last year. While we expect to see an absence of official El Nino or La Nina conditions, Pacific Ocean temperatures slightly favor El Nino warmth. Couple this with the possibility of negative NAO and AO conditions over the North Atlantic and it's prudent to follow the NOAA experts in calling for a better chance of above normal precipitation than below normal here in the Mid-South. These factors all indicate that, one way or the other, the region could be squarely in the path of a number of varying storm tracks. However, temperatures (as everyone knows who has lived here for any length of time) are the biggest forecasting dilemma, even a day or two in advance of a winter low pressure system. Frequently, the Mid-South sits right on the edge of temps that are cold enough (to the north) or too warm (to the south) to produce snow from passing winter weather systems (think "I-40 corridor"). I think that will continue to be the case this winter (which is not going out on a limb per se). But, the chance of having more wet systems moving through the region gives us the potential for additional chances that cold air could be in place at just the right time to produce some snowfall. I expect more snow than last year, but not necessarily enough to go down in the record books. Lastly, given above normal precipitation and a more active storm track, as well as possible above normal temperatures, I also give the Mid-South a slightly elevated chance of experiencing severe weather, especially late in the winter. We'll see how it plays out and you can call me a liar when the official stats come in next spring! Just be sure to re-read the disclaimer at the beginning of this article before calling me out... However it pans out, MemphisWeather.net WILL keep you updated on each system that affects the region throughout the winter, just as you have come to expect. Download our iPhone or Android apps, featuring completely updated interfaces and StormWatch+! Nowcasting services available on Facebook and Twitter. It's not unusual to see major weather systems affect some portion of the country during Thanksgiving week, creating travel nightmares. However, recent tranquil weather appears to continue it's grip on most parts of the nation, save the Pacific Northwest. In fact, not only will there not be much precipitation to contend with for the turkey holiday, temperatures for much of the eastern and southern portions of the country will be mild to downright warm. The graphics below from the GFS computer model show the precip and temperature forecasts for the holiday. Click a graphic for a larger image. Precip forecast for Wednesday evening. Outside of the Pacific Northwest, the nation will see dry weather and excellent travel conditions. Precip forecast for Thanksgiving evening. A cold front moving across the nation's mid-section will bring showers to the Midwest and Mid-Mississippi Valley. Precip forecast for Black Friday early morning. The cold front and it's showers will move into the Lower Ohio Valley and Mid-South, while showers continue over the Upper Midwest and Great Lakes. Mild conditions are expected Wednesday afternoon nearly everywhere east of the Rockies except for the interior Northeast. Mild conditions continue on Thanksgiving for the southern U.S. into the Midwest and Ohio Valley while cooler weather drops into the Northern Plains from Canada behind a cold front. Download our iPhone or Android apps, completely updated and featuring new interfaces and StormWatch+! 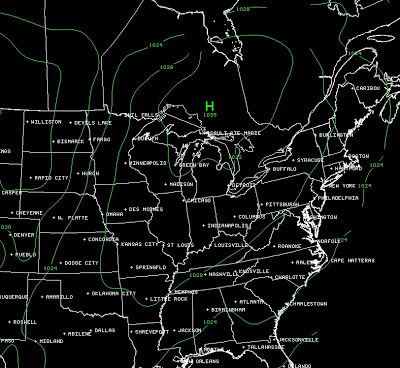 High pressure currently centered over the Great Lakes is dominating the weather for the central and eastern U.S., including the Mid-South. The area of high pressure is bringing cool and rain free conditions to the metro with temperatures ranging from highs in the low and mid 60s to lows in the upper 30s and low 40s. These conditions will continue throughout the weekend and into Monday and are very near average for this time of year. Monday evening and overnight into Tuesday a weak cold front will move towards the metro. At this time rain chances with this system look very slight, and any precipitation would fall in the form of light rain showers. Temperatures will not change much from Monday to Tuesday even after the front moves through the metro. The remainder of the week will see temperatures increasing 2-3 degrees each day with pleasant conditions. Thanksgiving Day and Black Friday are looking gorgeous with sunny skies and afternoon high temperatures in the upper 60s. In fact, much of the U.S. can expect dry and mild conditions on Thanksgiving Day with no expected travel issues except perhaps to the Pacific Northwest. The next chance for rainfall in the metro will come sometime next weekend and that could affect holiday travel (and shopping). 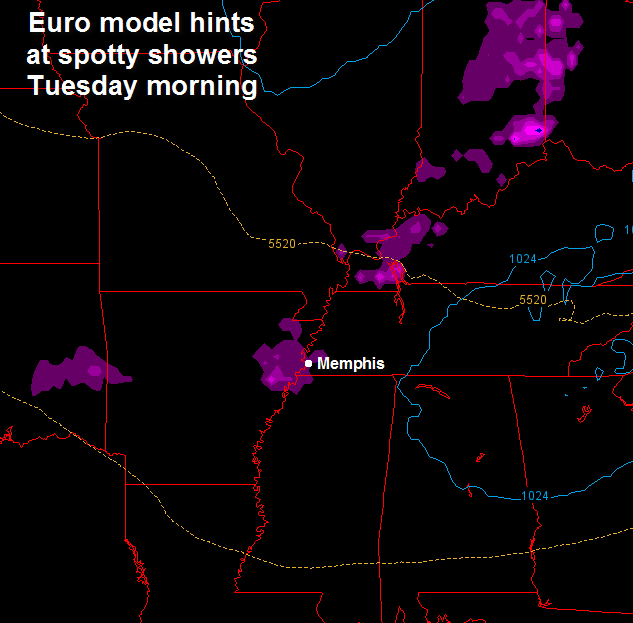 It is too soon for exact details, but MWN will keep you updated on this possibility as the week progresses. Some interesting cloud formations floated over the Memphis metro this morning as an upper-level disturbance moved through the area. Below is a great picture taken by Angela High along the north loop of I-40. 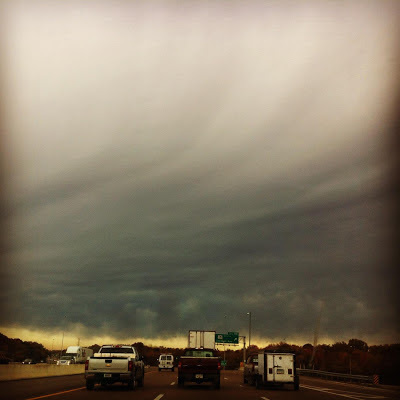 Virga descending from clouds over north Memphis on Wednesday morning. Photo credit: Angela High. With the disturbance passing by, these clouds had enough moisture to generate precipitation. However, due to very dry air in the layer beneath the clouds and above the ground, the precipitation evaporated as it fell. This evaporating precipitation, which looks like rain falling but never reaches the ground is called virga. Due to the evaporation process, some very interesting cloud formations can result - streaks that reach towards the ground, "balls" of cloud that appear to be descending, wispy clouds, etc. 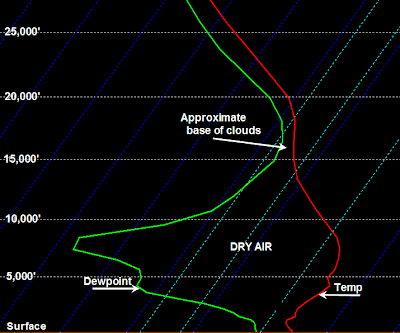 Below is a "sounding" of the atmosphere over Memphis at 9am this morning. Temperature is the red line, dewpoint is the green line and the top of the image is at about 26,000' while the earth's surface is at the bottom. When the green and red lines are close together, the humidity is high; when they are far apart, humidity is very low, allowing evaporation to occur. This morning, the base of the clouds were at about 15,000' and the precipitation was falling into a very dry area from a few thousand feet off the ground up to 10,000'. This is where the evaporation took place and virga formed. Atmospheric sounding over Memphis Wednesday morning, showing how virga formed. Did you see the virga, and did you know what it was when you saw it? From now on, you will! A beautiful weekend in the metro will turn stormy, then cold, by early next week. Currently we are experiencing above average temperatures with highs expected in the mid 70s both Saturday and Sunday. Overnight lows will only fall to the mid and upper 50s thanks to a southerly wind that will keep temperatures mild. A strong cold front will begin to approach the metro on Sunday with mostly cloudy skies and strong southerly winds gusting throughout the day. At this time, it appears the front will move through in the early morning hours Monday. It will likely be accompanied by a squall line of storms with strong wind being the primary threat, however occasionally heavy rain will be likely ahead of and just behind the front, roughly from 10pm Sunday through 10am Monday. The Storm Prediction Center has placed the area just west of the metro in a Slight Risk for severe weather Sunday night into Monday morning (see below). At this time the metro is not included in the slight risk, although it is still possible we could see a few strong storms after midnight on Monday morning and the outlook could change over the weekend. Heavy rainfall in a short period of time will also be a threat with storm totals of 1" or more common from this system. The Storm Prediction Center says areas just to our west could see severe weather Sunday afternoon and night. Heavy rainfall will accompany the front with 1"+ expected in most areas and near 2" in central AR. Behind the cold front, temperatures will drop significantly. Highs on Monday and Tuesday will only reach the mid 50s. In fact, Monday's high temperatures will be in the morning and we could experience falling temperatures during the afternoon. Wednesday morning will be the coldest of the next 7 days with lows in the city in expected in the 30s while outlying areas could easily dip into the upper 20s. The end of the work week will see a slight warming trend as winds turn back to the south. We will see temperatures rise back into the lower 60s for highs and overnight lows not getting quite as cold with lower 40s expected. 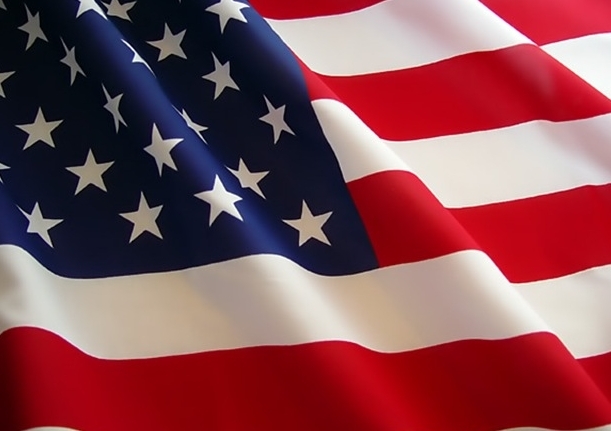 MemphisWeather.net salutes our nation's veterans, particularly those residing here in the Mid-South! We are proud to live in home of the brave and thank you for your service and sacrifice! Likewise, our service to all Mid-Southerners is to keep you safe from and informed about adverse weather. We'll continue to monitor the coming weather system and bring you the latest via the social media feeds below. As the Mid-South enters secondary severe weather season, now is also a good time to download our mobile apps for iPhone and Android devices and add StormWatch+ within the app. StormWatch+ is personalized weather alerts in the palm of your hand! Learn more at the links below. Downtown Memphis was treated to a somewhat rare sight early this morning, especially if one had a vantage point from above. A thick cloud of fog formed over the Mississippi River and drifted over downtown streets! 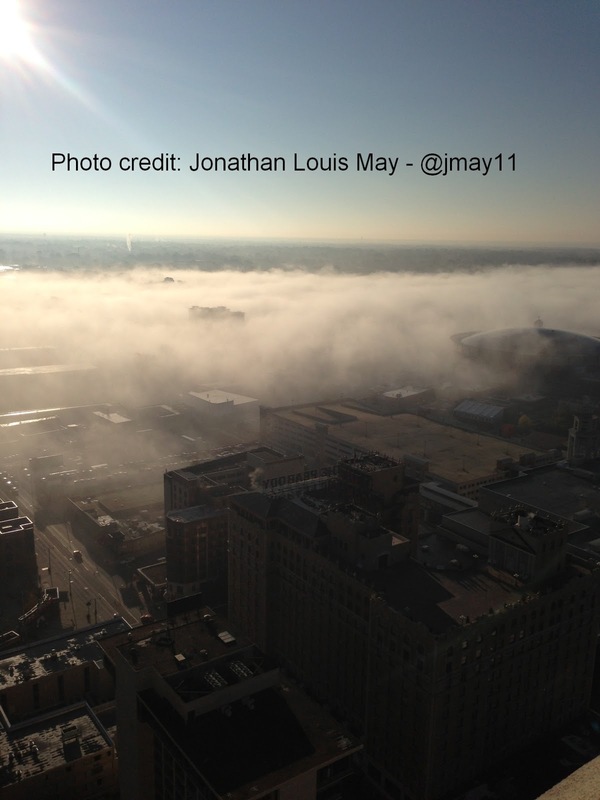 Photos taken by Jonathan May (Twitter: @jmay11) from the 29th floor balcony of One Commerce Square downtown (shown below) captured the essence of the surreal sight. Note that even the Hernando-DeSoto Bridge carrying I-40 traffic is nearly completely enveloped in the fog. 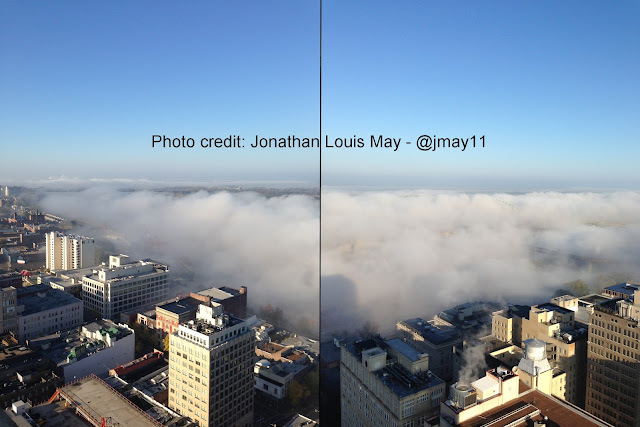 The bottom photo is taken looking southeast, away from the river, and shows that a "branch" of the fog had separated from the river and drifted east of the FedExForum towards the eastern portions of downtown. Process of steam fog creation, courtesy USA Today. What caused the fog? On calm, chilly fall mornings, "steam fog" or "evaporation fog" is a common occurrence over relatively warmer bodies of water. The necessary ingredients are the warm water below and cold, somewhat dry, air above, which are found in combination most frequently in the fall. If you've ever driven by a pond or other small body of water, especially in an outlying or rural area on a cold fall morning, it's not unusual to see low-lying fog over the water. This is called steam fog and it forms when cold air moves over warm water. As the warm water evaporates, it rises into the cooler air just above, cooling the rising air. The cooling process changes the water vapor created by evaporation into visible fog. In this case, the warm water of the Mississippi River produced steam fog on a grand scale! Air temperatures over the water were in the mid 30s, while the temperature of the water was likely 20 degrees warmer. Fortunately, temperatures stayed just above freezing downtown, but had they been a few degrees colder, steam fog can quickly produce "freezing fog," which leads to black ice, particularly on bridges. A few degrees cooler and this spectacle could have become a nightmare for commuters! How can you create fog in the same manner steam fog is formed? Exhale outside on a cold morning! See your breath? You just mixed warm moist air into cold dry air. You made steam fog! Download our iPhone or Android apps, completely updated and featuring a fresh user interface, with StormWatch+! Today's showery weather in the Mid-South is the result of an impulse in the mid-levels of the atmosphere that is dropping southeast into the region from Missouri. Over the next 72 hours, this impulse will move off the Mid-Atlantic coastline, strengthen, phase with a trailing impulse of energy, and explode into a Nor'Easter that will hit areas just affected by Hurricane Sandy last week with more strong wind, rain, and high surf. The Nor'Easter is expected to exacerbate the damage in coastal areas with additional high water and certainly will frustrate those in the Northeast that are still without power, fuel, and other essentials. More snow is expected inland from Vermont to western Massachusetts into southeastern (inland) New York and Pennsylvania. Strong wind could further damage fragile infrastructure and set back efforts to restore power and communications to coastal areas from Virginia to Long Island. Below are snapshots from the GFS computer model showing the progression of the energy creating this system. Locally, behind this system, we'll be under the influence of a trough of low pressure for another day before high pressure ridging takes hold, allowing temperatures to moderate heading towards the weekend. Our next chance of rain and thunderstorms arrives early next week and it's cause can be seen in the last panel below as another trough moves into the Pacific Northwest. For the complete MWN forecast, click here. 500mb mid-level impulse over the Mid-South at 6pm Monday. Huge ridge of high pressure over the western U.S.
500mb mid-level impulse moves to the SE Atlantic coast by 6pm Tuesday. Trailing energy diving into Mid-South from Canada. into the Mid-South, starting a warming trend for late week. Maturation of Nor'Easter as energy phases off the Northeast coast on Thursday evening. 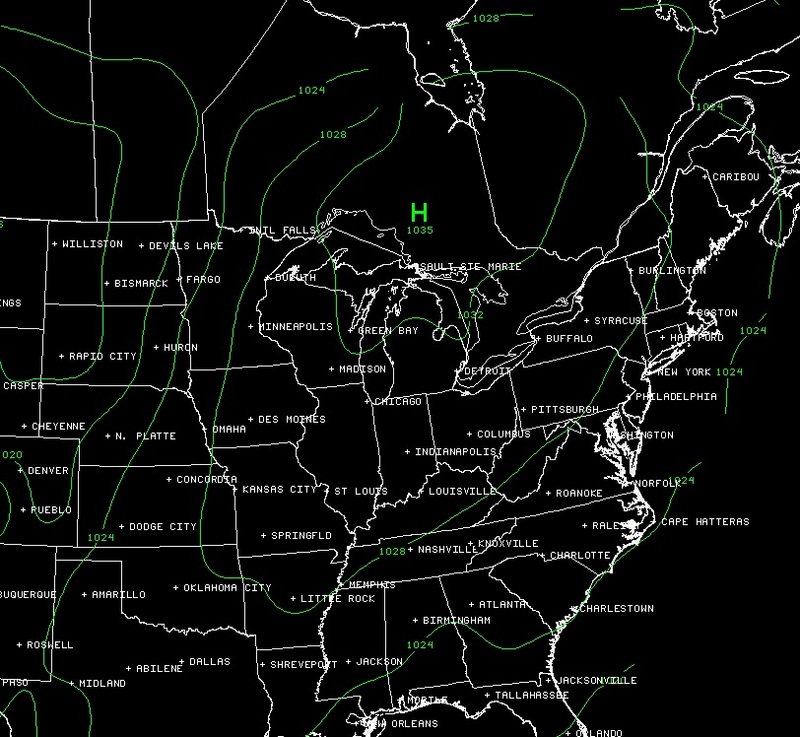 Ridge centered over Mississippi River Valley - very pleasant weather locally. Nowcasting services are available on our Facebook page and Twitter feed. For the first time in a year (since October 2011), Memphis International Airport finished the month with below normal temperatures as seasonal conditions, including multiple cold fronts, kept temperatures in check overall even with a few warm spells. In addition, precipitation was only slightly below normal, alleviating drought conditions a bit more this month, particularly across northwest MS. 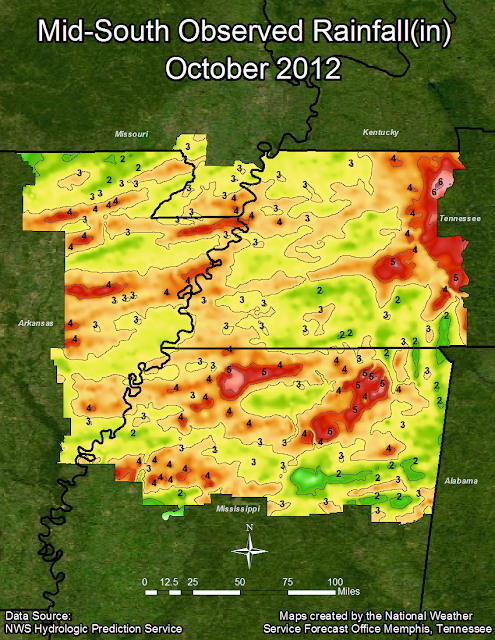 There was one severe weather event, on October 17, which prompted Tornado Warnings in Shelby County and other parts of the metro area. Funnel clouds were sighted but no tornadoes touched down. Straight-line wind of up to 80 mph produced damage in Millington, TN. Through October 31, the average temperature for 2012 of 69.0 degrees is 3.1 degrees above normal, making 2012 (still) the warmest year on record though the end of October, but only by 0.5 degrees (2007, 68.5 degrees). Drought conditions abated somewhat with local and upstream rainfall and 2012 is no longer among the top 10 driest years on record, though precipitation for the year is still over 12" below average. Most of the Memphis metro is now classified as being in a moderate-severe drought, down from extreme at the beginning of September. The average temperature for the month of October was 61.4 degrees, or 2.7 degrees below normal. The average high temperature was 71.4 degrees and the average low was 51.4. The coolest temperature of the month was 37 degrees on the 29th and 30th, while the highest temperature was 83 degrees on the 5th and 13th. There were no days in which the high reached 90 degrees or higher. There were no temperature records set or tied in October. Precipitation for the month totaled 3.66", which was 0.32" below average. There were 8 calendar days with measurable rainfall, only 2 of which saw totals of 0.50" or more (maximum 1.48" on the 17th). The peak wind gust was 43 mph from the northwest on the 17th as severe weather struck the area with an average wind speed for the month of 8.3 mph. Click here for a daily statistical recap for Memphis International Airport. The average October temperature at Cirrus Weather Solutions was 59.2 degrees with a maximum of 83.5 degrees on the 13th and a minimum of 33.1 degrees on the 30th. October precipitation measured 3.04" via the automated gauge and 2.72" in a manual gauge used for the CoCoRaHS program (not including a small amount of rain that feel prior to 2:30am on October 1). The measured peak wind gust was 24 mph on the 1st. Average relative humidity was a muggy 74%. Click here for a daily recap on MemphisWeather.net. For the month of October, the average temperature error in all MWN temperature forecasts was 2.45 degrees, lower than all available full-range computer model data and the National Weather Service. 72% of the MWN temperature forecasts for the month were within 2 degrees of the actual temperature. MWN's forecasts extend out five periods (2.5 days, or roughly 60 hours). For dewpoint accuracy, the MWN forecast averaged 2.54 degrees of error and fell within 2 degrees of the actual dewpoint 63% of the time. Historical accuracy statistics can be found here. Download our iPhone or Android apps, now with StormWatch+!